Its almost time …. Mexico, land of diversity — tourist resorts and awe-inspiring ancient cities. Our Intrepid travlers are about to experience the warmth and generosity of the Mexican people. On our journey we will know the everyday food, customs and traditions of Mexican life and take step back to a time of pagan mysticism. Colonial cities, Mayan temples, traditional cultures, rainforest reserves, dazzling coral reefs – our Encounter Expedition across the tropical 200-kilometer long coastline located on the eastern tip of the Yucatán peninsula, has it all. an abundance of history, culture and nature. Few places on earth cause as much amazement as the Riviera Maya. On the stunning coast of the Mayan Riviera lies the most beautiful sea in the world. the Caribbean, extending across the horizon and its incredible turquoise blue waters with the mild surf caressing the glistening alabaster white sand along an impressive stretch of palmed lined beach. 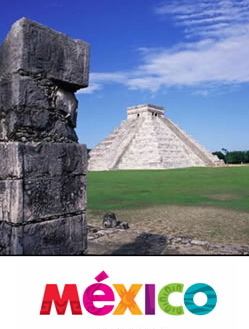 Mexico is an ancient land full of legends, fascinating history, ancient cultures and respected traditions. We will truly experience the spirit of the Mexican culture, and immerse ourselves in its essence on this 10 day/9 night Encounter Expedition. Remember, those of you combining travel and study for University credits or Educator/Professional Continuing Education credits need to complete your arrangements before we depart. It was St. Augustine who said, "The World is a book, and those who do not travel read only a page." We begin our journey through Mexico's Riviera Maya to experience the everyday customs and traditions of Mexican life by stepping back in time, to a time of pagan mysticism, Colonial cities, Mayan temples, traditional cultures, rainforest reserves and dazzling corral reefs. No country's prehispanic history is as rich as Mexico's. The great civilizations of Mexico shared several traditions and belief systems, but they also represented very distinct cultures. Who were the Aztecs, Mexica, Mayans, Mixteca, Olmecs, Totonacs and Zapotecs and what made them different? We will learn about their bizarre rituals and mind-boggling scientific advances on our 10 day Expedition. • Departing/Denver: ¡El dia de salida! Time to relax and jet south to Mexico's tourist capital! · We arrive at our entry point: Cancun International Airport • Hola! After clearing immigration and customs we are greeted by our private driver and travel two hours south to the Grand Coco Bay, a three star Caribbean hotel on the Mayan Riviera. · We settled in and took a stroll around and practiced our Spanish: Great shopping and restaurants were found along "Quinta Avenida" (5th Avenue) pedestrian promenade. This is THE place to see and be seen in the tourist zone and it's located one block off the beach, adjacent to the "Zocalo" (main square). We simply basked in the tropical Bohemian atmosphere. This evening we sailed aboard an authentic 93 foot Spanish galleon on the beautiful blue waters of the Caribbean lagoon. We dined on lobster or steak and enjoyed a swashbuckling pirate adventure along with fun and games aboard the ship. As we arrived and boarded the ship, we were greeted by host pirates and swept into fun, games, and dancing aboard the ship before sitting down to dinner. After dinner, we were be boarded by a second pirate ship, and a raging pirate battle ensued! Pirates swinging from boat to boat, sword fighting and putting on a real swashbuckling show straight out of the movies followed by dancing and partying. All good fun! We experienced two of the major cities of the Mayas in one great day! We explore the ancient city of Tulum, built on a cliff at the seas edge, believed to have been the largest port for the Mayans. This is not the largest or most impressive of the Mayan Ruins of the Yucatan, but thanks to the awe-inspiring setting it sticks in the memory like no other offering some of the most breathtaking views of the Yucatan coast. Considered by many as the most beautiful of the Mayan Ruins around the Riviera, it is small but exquisitely poised on the fifteen-meter-high cliffs above the azure waters of the Caribbean Sea. With our guide, we walked around Tulum's temples and learned about its cosmic and religious purposes. We also discovered one of the best kept secrets of the Riviera Maya, the natural reserve with a gorgeous natural aquarium. We took some time and walked down the steep stairway to the beach and played in the ocean for a while. From there we traveled to the beautiful and mysterious Coba, built in the jungle with towering pyramids. Coba, with its breathtaking views of the Yucatan Jungle from the tops of its magnificent pyramids, covers an immense area of some 50 square km. The ancient city was begun in A.D. 600, and thousands of Maya are believed to have lived here during the Classic period. Much of these ruins are still uncovered, and their remote jungle location suggests a scene from Indiana Jones and the Temple of Doom! Before leaving, we relaxed and swam in the Grand Cenote, one of the most famous of the sacred cenotes in this underground river of the Yucatan. Then we headed to one of the most incredible caves in Mexico, Aktun Chen. This Natural Park consisting of a spectacular 5 million year-old grotto and an abundance of wildlife, is the first above-the-ground cave system in the Quintana Roo State to be open to the public. The name means "cave with an underground river inside," and the main cave (of three) is more than 600 yards long, with a magnificent vault. Discreet illumination and easy walking paths made visiting the caves comfortable, without appearing to alter them much from their natural state. Here we explored the cave and the surrounding jungle in all its glory. Today, was a day to make our own adventure…centoes, snorkeling, ruins, swimming, lagoons, shopping, sun worshiping … strolling the beaches. Some walked the beach and climbed the exterior circular cement staircase to the top of Playa's attractive lighthouse (faro). The view was excellent and provided a great photo op. Others did some Beach-combing and hiked north making a whole day of it, relaxing in one or two beachside restaurants along the way. A couple of the girls took a memorable horseback ride into the jungles on the way to the dazzling Caribbean Sea. A stunning idyllic contrast between the sparkling white beaches and the azure blue waters. Gallopping up and down the beaches - just like a scene from a romance novel. I took a small group to explore one of Mexico's largest parks. The Sian Kaan Biosphere Reserve (meaning where the sky is born) has been an UNESCO World Heritage Site since 1986. The park covers more than 1 million acres of coastal jungle and is home to over 350 bird species and is sanctuary for the great diversity of plants and animals that live in the savannahs, dunes, wetlands, mangroves and lagoons of the reserve. We were met at our hotel by Rafael, an experienced biologist who explained life in the reserve and we witnessed it from a scenic observation tower. We kayaked in the wetlands and took in a snack at the visitor center. Then we hiked through the tropical jungle at Myul, discovering the plants and animals of the region and an ancient Mayan site. We then snorkeled at the Beh Ha cenote with its crystal waters and amazing caves. Our day ended with a meal in a Tulum family restaurant before returning to our hotel. Today our Expedition began at the ancient Mayan city of Ek Balam. The term means "black jaguar" in Mayan and this site may well have achieved pivotal status in the public affairs of eastern Yucatan and judging from its monumental architecture it was quite probably an influential city. Visually most impressive is its splendid central plaza bordered by three massive ceremonial structures. Recent research shows that the site was inhabited from as far back as the late pre-classic and early classic periods (100 B.C. - 300 A.D.) and on down to the time of the Spanish conquest and colonization. Next we discovered a Mayan paradise where their kings and courtesans reveled in direct contact with nature through meditation and relaxation. The sacred blue cenote, whose transparent water keeps the secret of the baths of the Maya kings and their courtesans, is the focus of Ik Kil eco-archaeological park. Just before our buffet lunch we swam and dove from the rock platforms in this fantastic "open to the sky", blue cenote. Then we explored the ruins of newest Wonder of the World, Chichen Itza where we learned about the Mayan culture and the wonder of the architecture, astronomy, and advanced civilization of the Mayas at the largest and most impressive of the Mayan Ruins of the Yucatan. A spectacular and mystical place to visit, this is a must-see on every tourist's agenda. Considered to be the most important ancient city of the Mayan culture, Chichen Itza has the most amazing examples of architecture in Mayan society. There is only one Chichen Itza and it extends approximately 2.5 miles from north to south, and arose at the end of the Classic period in the year 900 A.D. until the start of the Post-classic in 1200 A.D. Rediscovered in 1842, it is not until the twentieth century that its restoration began along with its resurgence as one of the most important and valuable sites of Mayan culture and basically humanity. While most of the group took a free day - Beth, Crystal and I went in search of something to do this morning. We took an ATV Explorer tour and drove our ATV across sand dunes, through jungle trails, and along the beautiful Caribbean Sea on a tour that took us well off the beaten path, through the Mayan jungle to visit three seldom-seen treasures of the Yucatan. We admired the underwater stalagtites and stalagmites as we snorkeled through the cenote, then we were off to visit a lost Mayan Ruins site, where we looked back into the past. The last stop was a dry cenote, where spectacular formations have been carved through the years. What did we see? *Spider Monkeys in the trees feeding on fruits! *Amazing underwater formations as you swim in a Freshwater Cenote! *Ancient Mayan Ruins and a glimpse of the distant past! *Dry Caves - truly spectacular! That afternoon we ate lunch at a beach side cafe, took a short siesta under the umbrella. Then we were carried out to the barrier reef by our guide in a small boat and took an amazing snorkeling tour of the coral park. We saw an incredible array of sea life - to include a barracuda. Then back to the hotel and dinner on the Promenade. Today was the day to relax… kick back. Get in the mode. The slow pace of Mexico is even slower here in the Caribbean. We don't feel like you have to do things all the time. Just strolling around town, eating good food is enough excitement for at least part of the Expedition. Luckily Mother Nature provided us with the best possible set-up for relaxing – the beach! The beach here is truly fantastic. The white soft sand never gets hot, so you won't burn your feet. The clear turquoise Caribbean Sea is warm and clear. From the blue sky the Caribbean sun heats up your body and your mind. Sitting in the waves on the edge of the continent is a great way to spend your time. Most of us decided to soar like a bird over the jungle on A zip line. For those of us who didn't think a relaxing lazy day is the idea of fun, took off for the heart of the Riviera Maya, wherein lies Selvatica, an ecological park covering more than 250 acres. In this park, is the Selvatica Canopy Tour, and a series of 12 exciting zip lines, including the longest zip line in North America, stretching an astounding 2,000 feet. We were strapped into a secure harness and zipped through more than 20 Acres of Mayan jungle, a truly amazing experience. We flew through the air as adrenaline rushed through our veins, and some squealed with delight. You'll flew from platform to platform, with the greatest of ease. The guides asked for someone crazy - and of course Jenny volunteered immediately. They hung her upside down on the zip line and sent her across the jungle tree tops. Sounds fun, right? Well, guess what - that's wasn't all! This exciting tour also took us mountain biking to a hidden Cenote, where we swam, and even zip lined into the Cenote pool itself. After the zip lines, we hopped on a Trek aluminum mountain bike, and rode through the Mayan jungle to the Green Light Cenote, about a one mile ride. Here we used the diving platform, rope swing, or even rode a zip line right into the water. After the swim, we rode back for a provided lunch in the jungle. That afternoon, some of us took the time to visit the aviary Xaman-Ha and see its many interesting and rare species of birds from the Yucatan Peninsula. It's well worth a visit and was our only chance to see toucans and pink flamingos. There is a large 'cageless' habitat where the birds can be observed as if they were in their natural setting. It's a great outing that is close by, easy, and self-paced. I suggest mornings and late afternoon for the best bird watching. Today we visited Xcaret, an intiguing recreational and educational Eco-archaeological park that is perhaps the first of its kind. Xcaret was, and still is, a 5-star resort for the Mayan Rulers. In addition to cultural, historic and archaeological attractions, the Xcaret Park's 250 acres include a vast play area where we swam, sun worshipped, snorkeled, rode on horseback, engage in water sports such as swimming with dolphins, snorkeling in the underground river and being entertained by folkloric and equestrian performers. The Xcaret Park is located on a stretch of the Caribbean coast of Mexico. This inlet was once an embarkation point for Mayan pilgrims en route to worship at the shrine of Ixchel, the Goddess of Fertility, where the Mayas are said to have bathed in the inlet to purify their bodies. Xcaret is a Mayan word meaning "small inlet." (The Mayan "X" is pronounced approximately "sh", hence the name is something like "Shcaret" when pronounced). The area around the "little cove," was inhabited by these fascinating people from A.D. 1200 to 1500. Mayan culture and history are preserved in the park's museum and in the small Maya archeological ruin sites scattered throughout the park's 200 lushly landscaped acres. Much of the Xcaret Park is devoted to nature attractions, many of which encourage visitor participation. Topping the list are two underground rivers consisting of crystal-clear freshwater. Outfitted with a lifejacket and snorkeling gear, Mark, Sam, Beth, Austin and I floated along the waterways, passing through a series of beautifully illuminated limestone caves. Above ground, Jenny, Morgan, Cierra, Ryan and Brent were basking on a white sand Caribbean beach, we also snorkeled through an inlet brimming with tropical fish and just relaxed in a soothing freshwater lagoon. While some of us watched as trained dolphins performed at the Dolphinarium, Joanne, Aubrette, Judy and her two boys got into the water and swim alongside these high intelligent sea mammals. The Xcaret Park's aquarium allows you to view marine habitats representative of the main Eco-systems of the Caribbean Sea, including coral reefs; you can also touch live starfish, manta rays and other sea creatures. The bird lovers among us particularly enjoyed walking through the aviary, where more than 70 species can be observed. Xcaret also has its own Mexican-style ranch, complete with horseback-riding facilities. For those that weren't equestrian, an adjacent restaurant provided the perfect venue for watching a Charro performance by thoroughbreds. Xcaret Park's botanical garden is a nice place for a respite. In an atmosphere of quietude, we discovered more than 80 varieties of indigenous plants, bushes, flowers and trees. Xcaret's restaurants have been creatively designed to complement the park's natural setting. We dined outdoors under palm frond roofs on fresh seafood and Mexican specialties. Morgan, Cierra and a couple of the girls, hopped on the ferry and traveled just across the beautiful Caribbean Sea from Playa del Carmen, to explore on their own the island of Cozumel, known around the world for its dazzling coral reefs and crystal clear waters. Although the biggest island in the country, it's small enough to cover as a nice day trip. The town on the island, San Miguel, offers some nice restaurants and tourist shopping. What the island really has going for it is the snorkeling and diving. Cozumel has been a diving destination since the 1960's when Jacques Cousteau made the world aware of the incredible reefs of the area. To get around the island you will need transportation (taxi, rented car or, more commonly, scooter), since there really is no bus service. There are a few small Mayan ruins to visit. The Jeep Safari and Snorkel is a great way to experience the island of Cozumel. Once on the island, you'll be whisked away in a Jeep, to be shown the wonders that this island possesses. You'll see the back roads and the magnificent but remote beaches on the back-side of the island, as well as snorkel on some of the most beautiful coral reefs in the world. You'll first visit Punta Langosta ("Lobster Point"), marked by a lighthouse, continue on to El Angel Azul Reef for 45 minutes of incredible snorkeling where you'll be surrounded by a dazzling array of tropical fish. Next, your tour will pass through downtown San Miguel, the main city on Cozumel, on your way to El Cedral, a town which was once the hub of Mayan life in Cozumel dating back to 1518 and later became its first city in 1847. The tour continues past unspoiled and beautiful beaches, accessible only by four wheel drive as you reach the road's end at Punta Mola on the far northern point of Cozumel, where you will enjoy a picnic lunch. After lunch, we'll head back to San Miguel where you'll have an hour to shop in the many excellent boutiques before heading back to the dock to catch the ferry back to Playa Del Carmen. The more adventurous of us charted a yacht and went Deep Sea Fishing and snorkeling. Some of us slept in, others enjoyed a free morning. We had a few hours this morning to walk the beach and capture one last dose of the Caribbean. • Transfer to the airport, where we checked in for our return flight home. My students were excited, anticipation was high before we left and the enthusiasm didn't wane during our trip. There is so much to see and do. Facing the Riviera Maya's coast is the world's second-largest coral reef, making it the perfect place for swimming, scuba diving, snorkeling and kayaking. Hundreds of marine species, including multi-colored tropical fishes, sponges, starfishes and various types of coral make up the spectacular and fragile Great Maya Reef. We hit the beach and enjoyed the many water-sports from parasailing, windsurfing to deep sea fishing, jet-skiing and peaceful snorkeling. Some simply went and lay on the beach and tanned. The waters were crystal clear, boasted incredible visibility, and a diversity of marine plant and animal life forms in size, shapes, and colors that will astound the pro and novice alike. Near the shore, a low-elevation jungle, typical of the tropics, acted as a wall to the sea. Practically impenetrable, it's a habitat for a rich variety of flora and fauna, and geological formations that would be impossible to find anywhere else in the world lying hidden amid the intense green. Here are the "cenotes", sweet-water deposits of capricious shapes and different sizes, produced by the subterranean rivers that emerged to the surface over the course of millions of years. We entered the heart of El Mundo Maya (The Maya World) and explored the spectacular ruins of lavish temple cities that rise out of the misty rainforests. We discovered the living Maya culture in traditional villages of the remote outback jungle. This zone was not only the center of an antique and amazing civilization but today is still inhabited by authentic Maya communities that continue to preserve their millennium-old culture and the lifestyle of their ancestors practically unchanged. The Riviera Maya is a place to enjoy marvelous beaches by day and a lively nightlife in the evening. After the beach and jungle trips La Quinta Avenida provided us with an abundance of dining and fun options making it a favorite spot for meeting with a nightlife that goes on until dawn. Dozens of varied restaurants were available to meet our budgets and varied tastes. There is a tranquil and serene atmosphere and attitude that you won't find in other tourist meccas. I know the kids spent many nights dancing to live music at some local hotspots. For the elders among us (me, Joanne, Judy), we simple strolled along the pedestrian-only walkway running perpendicular to the beach and discovered mexican arts and crafts shops, world class restaurants with fine dining and great shopping opportunities. The restaurants run the gamut from fresh seafood to T-bone steaks. Traditional Mexican, Yucatecan, French, and Italian dishes are all offered. Whatever the taste, chances are we found it here.